Peonies (Paeonia spp.) are spring-blooming perennials that have existed in human folklore for thousands of years. In China, where the peony is the national flower, peonies symbolize riches, honor and high social status. In the West, the peony symbolizes boldness, and is the state flower of Indiana. The flower is also the traditional flower for the 12th year wedding anniversary. Major species include the tree peony (Paeonia suffruticosa), a woody deciduous shrub, and the common garden peony (Paeonia lactiflora), an herbaceous perennial, and Japanese peony (Paeonia lactiflora "Nippon Beauty"), a scarlet common garden peony cultivar, all of which require moderate care and maintenance to thrive. Peonies will produce their best blooms in a location with full sunlight. Though they will tolerate partial shade, plants weaken and flower buds fail to develop properly in shadier sites. Large-flowered tree peonies can benefit from a little afternoon shade, particularly in the southern end of their range. Tree peony is hardy in U.S. Department of Agriculture plant hardiness zones 4 to 8, while the common garden peony is hardy in USDA zones 3 to 8. Plant peonies in a location with some shelter from strong winds. This is especially important for tree peonies. Plant peonies in a well-draining, organic soil. You can improve drainage and add organic matter to the soil by mixing 2 to 3 inches of compost, well-rotted manure, fine pine bark or peat moss into the top 6 to 8 inches of the soil. Water regularly to keep the soil moist, but not water logged or flooded. In the spring, fertilize with 4 to 6 cups (1 pound = 2 cups fertilizer) of a 5-10-10 or 5-10-5 fertilizer per 100 square feet of bedding area. Do not allow fertilizer to touch the stems of the plant. Water well after fertilizing, and store unused fertilizer in a secure location away from children and pets. Remove spent flowers to prolong the bloom period, keep the plant looking tidy and help prevent disease. 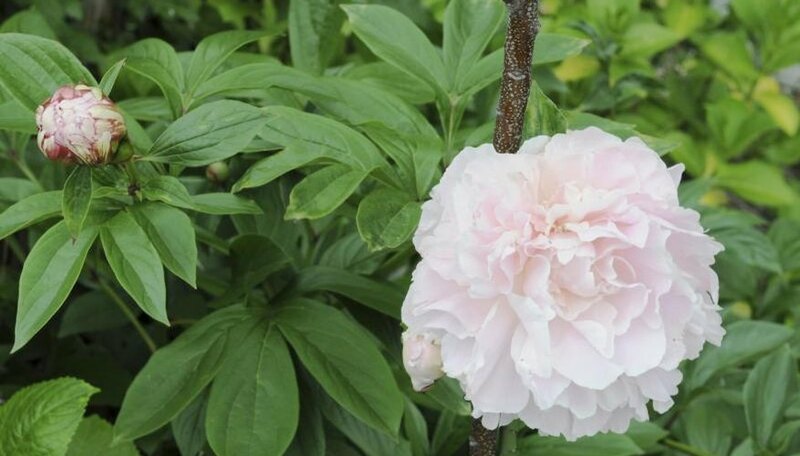 In early spring, prune tree peonies to remove dead or diseased wood and suckers, and prune straggly growth in early fall to encourage a bushier habit. Garden peonies should be cut down to the ground in early fall; destroy plant debris afterwards and cover planting area with 1 to 2 inches of mulch. Do not cut down tree peonies however. Disinfect pruning equipment by soaking tools for 5 minutes in a solution that is equal parts rubbing alcohol and water. Rinse with water and air dry. Common garden peonies may require staking to keep them from falling over. Remove weeds from the planting area, which compete for nutrients and water in the soil. As a whole, peonies are not usually bothered by serious pests or diseases. Though ants are attracted to the flower bud sap of peonies, ants do not harm the plant. The fungal disease botrytis blight is the most common disease for garden peonies, causing gray mold and necrotic patches on foliage. Peonies planted in poorly draining, shady or crowded sites are more likely to develop the disease. Avoid overhead irrigation and space peonies at least 3 feet apart.